The 800 group Community Volunteer Awards took place on 7 June at The Shankly Hotel in Liverpool and Nugent and our volunteers triumphed yet again. 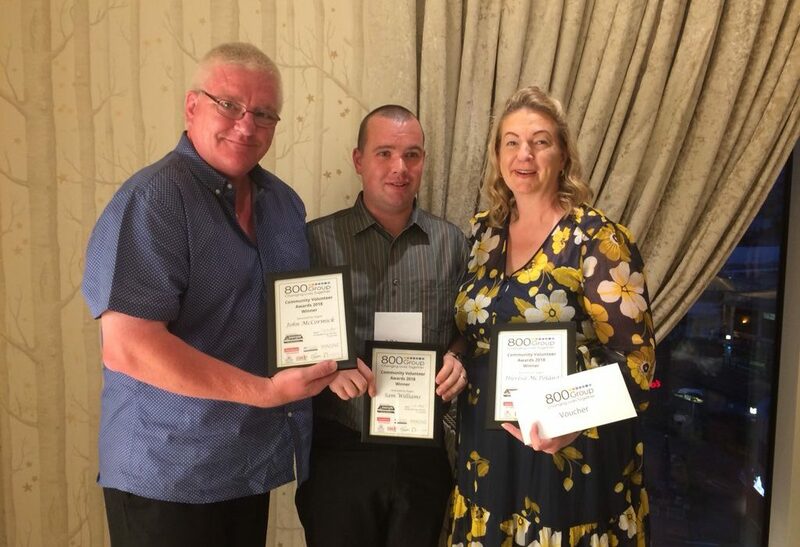 Nugent was awarded Charity of the year for the Third Year running, whilst our amazing volunteers, Theresa McPoland, John McCormick and Sam Williams received the Winners Awards, voted by the 800 Group organisations staff and service users. John McCormick also picked up the Volunteer of the Year Award for his 37 years service! John has been a volunteer with Nugent for over 37 years at Bootle Group (social club for adults with learning disabilities). John stared by going along to meet and support people in a local community group and has been running the Thursday evening group for 32 years. The group has become a shining light for its members, a hive of activity with games, crafts and music.” Members describe John as an ‘inspirational, hardworking and a friend who is truly passionate about making sure people with learning disabilities are included and involved with their local community’. John balances his full time job, family life and the group with never ending energy and a smile on his face. John ensures all members are able to attend the group and every Thursday he drives the minibus round the local area to pick members up and take them to the Centre. John has a group of dedicated volunteers helping with activities and ensuring everyone has a chance to join in. John organises fundraising activities to provide vital funds for trips and nights out for all group member. The group not only helps the 20 plus members who attend each week but the reach is extended to the families and carers of the members, as a result of their loved ones attending this group, their family members are able to receive some much needed respite from the care that they deliver for their loved ones. Sam is an integral member of Nugent Community Caritas Teams supporting with collections and distributions from the local community, these collections support service users who are homeless or at risk of homelessness and are vital in the support we offer to this client group. Sam has a quiet manor but can always be relied upon at and will always put other people first. Sam will always respond or help with anything that is asked of him, nothing is ever too much trouble for Sam and once he has committed to helping out he will always turn up and never lets anyone down. Sam can be called upon at short and he will always accommodate the request to support the service users and Nugent come rain or shine. Sam has been volunteering with Nugent for over 12 years and always finds the time to support Nugent whilst also working full time. Theresa volunteers in a number of roles within Nugent as is always putting others first. Theresa volunteers in our Charity Shop, she helps with the day to day sales, she coordinates a monthly coffee shop that is run by Nugent volunteers at a city centre auction house, this project promotes the work of Nugent and helps raise funds to support older people with dementia. Theresa is also a 1 to 1 befriender, she visits and takes out an older lady who has become very cautious about going out following several falls. Theresa befriending role has empowered the lady she support to engage within her local community and has given the lady support with feeling confident enough to go on regular visits to local shops. Theresa also volunteers with other organisation and volunteers most days she helps to feed the homeless and she visits people who are at the end of life , this is all done whilst ensuring her family are supported and loved. Theresa is always keen to help whenever possible and can always be relied upon. Theresa is really valued by Nugent and the time and commitment she gives to others on a daily basis needs to be acknowledged. Alongside our award winners have many amazing people volunteering across our services, supporting people and helping our staff. Tommy has been volunteering with Nugent since retirement and began volunteering with Nugent in May 2015 at our Opening Doors project supporting isolated older people in Knowsley where he provided support to several clients who are isolated and lonely and struggled to get out of the house alone. Thomas supported one 84 years old lady who had not left the house for 9 months due to a leg injury. Tommy persuaded her to go, with his support, to attend chair based exercises in her local community centre for 6 weeks which she continues to attend. The lady said “Thomas was kind, patient and very helpful. He was like a brother or son to me and I am very grateful for his help”. In 2016 was crowned Volunteer of the Year at Knowsley Sports and Culture Awards. Tommy has also provided support at St Joseph’s Care Home in Aigburth, driving a mini bus and enabling people with various physical and mental disabilities to participate in fun days out. On a weekly basis Tommy provides a collection service for our Charity Shop in Allerton and has completed Read to Lead training with the intention of offering reading sessions on a one to one basis to some of our service users.